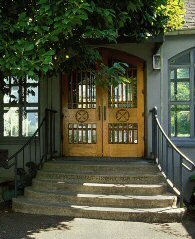 Grace Memorial Church in Portland, Oregon, regularly opens its doors to the community. A few years ago, Grace Memorial Episcopal Church in Portland, Oregon hosted a community dinner on Friday nights serving a range of people in need, from the homeless to isolated elderly people. Rev. Stephen Schneider soon noticed that people seated at the only two circular tables in the room seemed to be conversing more, making deeper bonds with one another. Eager to encourage more of this, he had all of the long tables replaced with circular ones. Today, Friday nights at Grace Memorial are noisy, joyous, and well-attended affairs, where people come to take part in the informal communities they have created around these tables as much as they come for the free meal or the opening prayers. Rev. Schneider believes this shared interaction in a nurturing public setting is sometimes more sacred and necessary to the Friday-night regulars than a good meal or a moment of spiritual reflection, and he is happy to provide them with it. Houses of worship are the original public places, where people gather not only to pray but to talk, drink coffee, eat donuts, play basketball, attend classes, hold meetings, hear music, engage in community service. (In Minneapolis, one Polish Catholic church even has a multi-lane bowling alley in its basement.) The front steps of a church often function as a town square where people linger after services to talk. Many religious buildings become a beehive of community activity as social, political, charitable and cultural groups meet or have offices there. While many neighborhoods don't have a library, museum, arts organization, or even a school that can become the fulcrum of community activism and growth, nearly all have a church, synagogue, mosque or temple. Religious institutions have a powerful role to play in their communities, addressing pressing issues from poverty and injustice to planning and traffic. 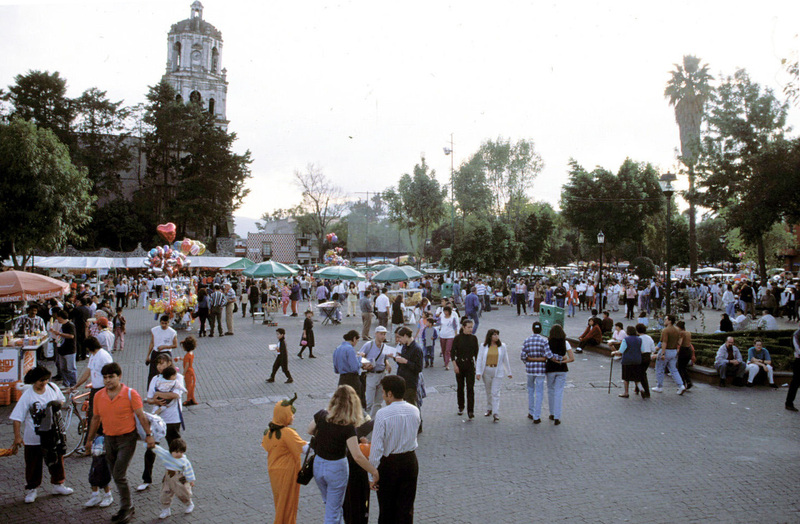 Mexico City's Plaza Hidalgo is anchored by the Parroquia de San Juan Bautista church. Even in nations like the United States where there is no officially sanctioned religion, churches, synagogues, temples, mosques, and other sacred spaces can play a pivotal role in the life of a neighborhood or town, often becoming the vibrant site of public engagement and community connections. Many spaces' spiritual functions are complemented by another identity as a public gathering spot. "We began to realize that we have one of the very few public spaces in Cobble Hill," says Rev. Ron Lau of Christ Church in Brooklyn's Cobble Hill neighborhood, "and we wanted to feed on that. Looking at our history, you can see that we prospered most when we directed our mission and efforts beyond our doors. We don't worry about how many people are here on Sunday morning; our mission is defined as how we serve our community outwardly." In recent years, 166-year-old Christ Church has gone so far as proposing to replace traditional sanctuary pews with movable seating, allowing a wide range of new uses and functions to the church's largest space. "Soup kitchens, arts groups, neighborhood associations, day-care centers, and Alcoholics Anonymous need places to meet, and congregations usually possess auditoriums, fellowship halls, and classrooms that can easily fulfill these needs," explains the website of Partners for Sacred Spaces, a nonprofit group focused on the maintenance and community use of religious buildings. They believe that locating public activities within sacred spaces is just good sense. It seems entirely natural that we go to churches to vote, attend public meetings or enjoy neighborhood social functions even when we are not members of the congregation. 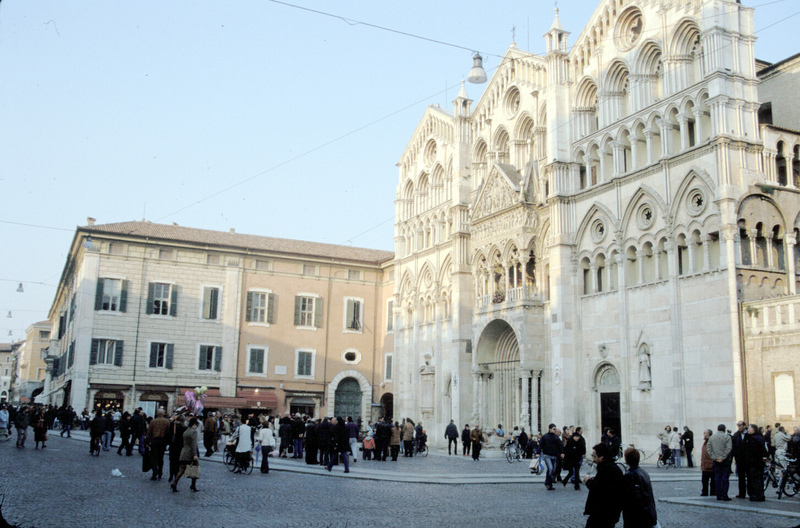 Locals congregate outside a church in Ferrara, Italy. Throughout history sacred spaces have also served an important function as public spaces, essential to the overall life of the community. In medieval Europe, churches were once the central public institution of any city or village, used not only for religious gatherings but as centers of political, economic, and educational activities. In Antwerp, Belgium, as in many Continental cities, shops are built right into the side of the main Cathedral, which is just a few steps from the market square and city hall. Religious buildings aren't the only form of sacred space that adds to the public realm. The term "sacred places" can be interpreted in a variety of ways. From a humble grove of trees to an elaborate cathedral or temple, the nature of belief in all cultures calls for a literal place on earth where people can gather, reflect, play, meditate and feel attuned to the broader forces of the universe. Mecca, Macchu Picchu, Notre Dame Cathedral, Mount Fuji, the Wailing Wall, Stonehenge, Lourdes, the Ganges River, and the Black Hills of South Dakota are some of the more famous sacred spaces, but other examples can be found all around you. Sacred places have much to teach us about the profound ways that people connect with and gather in public, and ultimately how communities can collectively share experiences and emotions. But sacred spaces also offer a more spiritual (although not necessarily religious) experience to the wider community as places of calm respite, where the clamor of our fast-paced society can melt away in a space designed to be used collectively and individually, for reflection and soul searching. This is a fundamental function of any religious setting, with roots going all the way back to the sacred groves and springs where our pagan forebears gathered to be one with the Gods. Seeking out a place of natural wonder is still central to the faith of most indigenous people as well as emerging nature-based religions like Wicca, and is becoming more prevalent as mainstream religions revive the tradition of contemplative gardens. Sacred places can help to shape the identity and legacy of a town or city as much as secular spaces such as parks, iconic buildings or commercial districts. Notre Dame is as moving symbol of Paris almost as much as the Eiffel Tower, and more visitors may come home from San Francisco with more vivid memories of Grace Cathedral, located in a defining spot atop Nob Hill, than the iconic Transamerica Building. Sacred space often arises from remembrance. Shared memories and association with historical events can emotionally link people to a place, infusing it with meaning even if they have never physically visited it. Park-goers who pause to gaze up at war monuments or memorial statues are connected to a history of struggle and sacrifice that they may not even be aware of; drivers who pass handmade roadside memorials to accident victims may reflect on the lives of strangers. On a larger scale, the collective, tragic experience of 9/11 has transformed Ground Zero into a sacred spot in the minds of nearly all Americans and millions of others around the world. But the World Trade Center site is also a literal place with a meaningful purpose for the millions who visit it to grieve and remember. These kind of public activities give this sacred ground deeper meaning and, ultimately, powerful potential for healing and community building. A growing recognition of the pivotal role that sacred spaces play in the life of our culture has given rise to new efforts focused on ways religious buildings and grounds can further the public life of cities and towns. This process begins with an informed understanding of what makes a great place. PPS uses four major characteristics to identify what makes good public space; 1)Activities and Uses; 2)Sociability; 3)Comfort and Image; and 4)Accessibility. The potential of sacred places to become great public settings with a power to draw people and instill a sense of community based on ideas, beliefs, history, remembrance, or simply respite from the hustle of daily life, is almost limitless. 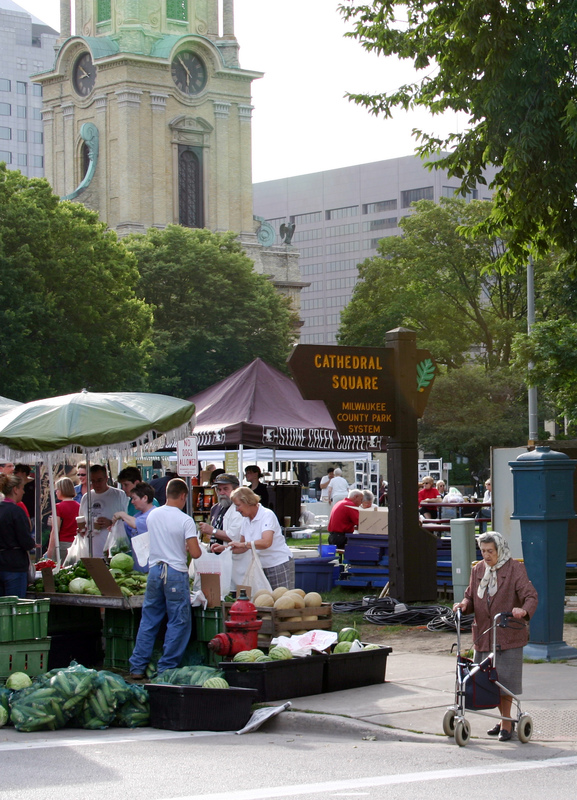 The farmers market at Milwaukee's Cathedral Square. PPS believes that our 30 years of experience in helping citizens envision better public spaces and our understanding of what makes places accessible to people can be valuable in helping congregations and religious leaders expand the potential of their own sacred spaces' becoming more involved in the web of city life, taking bigger risks, welcoming different kinds of people, and widening ideas of what communities are really about. Houses of worship provide opportunity to boost community interaction and livability in New Jersey's capital city In 2006, PPS partnered with Isles, a nonprofit community development and environmental organization in Trenton, New Jersey, to develop an inner city walking tour that would complement the annual Trenton Spirit Walk--an event that celebrates Trenton's more than 100 houses of worship while at the same time fostering increased social interaction among citizens and promoting a healthier lifestyle of walking and exercise. The potential of religious sites as integral parts of the wider community was used to re-assess and improve Trenton's livability (walkability, sense of place, public health & safety), its destinations and the connections between them (houses of worship, parks, recreational facilities, schools, the Delaware River, libraries, senior centers, other civic and cultural institutions), and the infrastructure that should support healthy community life and interactions.